Is your pet acting stiff or having difficulty rising in the morning? Is your dog recovering from back or joint surgery? Is your cat not able to jump on her favorite spots? You should call us. Healing Arts Veterinary Center is the premier Canine Rehabilitation Center in Palm Beach County. Utilizing some of the same techniques as in human medicine, we can return your pet to a more functional state. Therapeutic massage, joint mobilization, heat and cold therapy, stretching and range of motion exercises are implemented to achieve our goal. 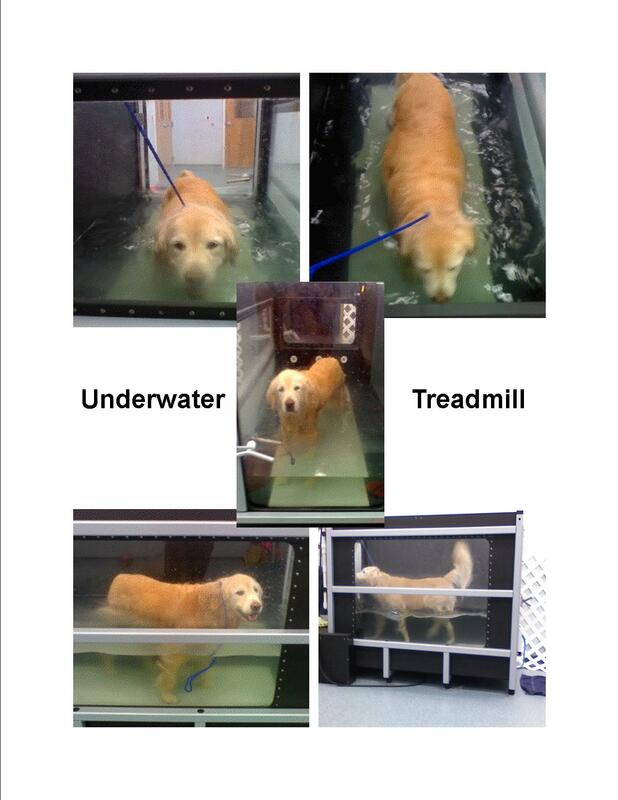 The Underwater Treadmill is designed to reduce the force of gravity on your pet so it can move freely. Even the most debilitated patient can benefit from this treatment. It promotes greater range of motion and strengthening of atrophied muscles. At speeds of up to 5mph and with the addition of resistance jets, the Underwater Treadmill is great for conditioning and endurance training for agility and sporting dogs. The Class IV Therapeutic Laser is the latest innovation designed to reduce pain and inflammation. It is ideally suited for the post operative or chronically debilitated patient. Laser therapy can also reduce or eliminate the need for medication. Our Canine Biofeedback Weight Analysis equipment is used throughout the treatment sessions. By evaluating your pets weight distribution, we can objectively monitor the response to treatment. A treatment plan will be created for your pet after an initial consultation and physical examination. Visit our page on YouTube to see some of our rehabilitation and laser patients. Zoe is a 5 year-old Labrador Retriever mix. She is a high energy dog that loves to spend time with her owners, playing Frisbee in the yard. It was during one of these play sessions, in mid-December, that Zoe began to hold up her left front paw, as though it had been injured. When she attempted to continue to walk and put weight on her paw, she collapsed and was unable to move any of her legs. Her owners rushed her to the nearest emergency clinic for help. Zoe was then transferred to a neurology specialist in Melbourne and then again to the University of Florida. Doctors were unable to determine the exact cause of her paralysis, despite numerous tests, x-rays and even an MRI. The specialists at the University of Florida recommended that Zoe begin physical therapy immediately, and referred her mom and dad to Healing ARTS Veterinary Center as somewhere that was close to home and would be able to give Zoe the attention and treatment that she so badly needed. Zoe began a daily regimen of Class IV Laser therapy, stretching and range-of-motion exercises and Thera-ball treatments on December 28th, 2010. When she began the treatments, it was necessary to carry her using a stretcher, as she was unable to use any of her legs or even lift her head. By January 6th, 2011 she was able to hold up her head and get up from a laying position on her own and walk a few steps. We then started using a cart to assist her to walk. As she became stronger, we started her on Underwater Treadmill therapy. This has continued to help to improve her muscle strength. We were recently able to decrease her treatments to three times a week, as opposed to every day. It is important to note that no medications were used during her recovery. Zoe has improved so greatly that she is now able to walk into the building on her own. Oftentimes, she?ll walk in the front door, down the hallway and straight into the playroom, where she likes to visit and play with the other dogs that are here for daycare. She continues to astonish us with her spirit and will to get better. Currently she is being fitted with an orthopedic splint to help stabilize her left front leg which was the most adversely affected. We will continue to work with Zoe and do everything we can to get her back outside, playing Frisbee.